The Herbal Aloe Strengthening Shampoo and Strengthening Conditioner are perfect daily use products to ensure that every day is a good hair day. Sulfate-free, paraben-free, and free from added colors and dyes, the Herbal Aloe products are your first line of defense against unruly hair. In combination, the shampoo and conditioner can leave hair up to 10 times stronger, while improving hair strength by up to 90 percent after just one use. * Safe and gentle for color-treated, dry and damaged hair. Available in family size and convenient travel sizes for your on-the-go lifestyle. 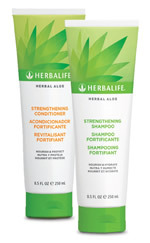 * When Strengthening Shampoo and Strengthening Conditioner are used in conjunction versus untreated hair. Results based on Clinical Strengthening and Breakage Study. 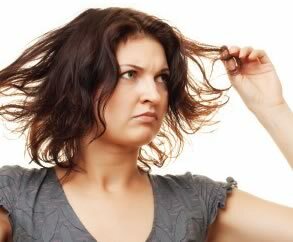 Average value obtained from Combing Test conducted by an independent research laboratory on “damaged” hair tresses. Broken fiber counts were compared on untreated versus treated hair using Herbal Aloe Strengthening Shampoo and Strengthening Conditioner.